Ross Dual-Shaft Mixers deliver an ideal balance of bulk flow agitation and high speed dispersion required in the processing of viscous pastes, gels, suspensions, slurries and emulsions. These machines feature two independently-driven agitators than run at different speeds, imparting varying levels of shear and ensuring adequate turnover over a wide viscosity range. Production models are offered in many standard sizes up to 4000 gallons capacity. Pictured is a Dual-Shaft Mixer Model CDA-500 with a maximum working capacity of 500 gallons. An air/oil hydraulic lift raises/lowers the agitators from/into the mix can. NEMA 12 safety limit switches prevent operation of the drives when the mix vessel or agitators are not in the proper position. All product-contact parts are stainless steel 304 with mill finish and welds ground smooth. The heavy-duty Two-Wing Anchor Agitator and dual-blade High Speed Disperser are driven by 10HP and 100HP inverter-duty motors, respectively. Hinged Teflon scrapers are attached to the anchor for wiping of the vessel sidewall and dished bottom. A tungsten carbide coating on the saw-tooth disperser blades allows the mixer to be used with abrasive materials. The custom mixer cover includes appropriate connections for ingredient addition, dust collection and a delumping device. A thermowell with type “J” thermoprobe is also mounted through the cover. A 50-psig stainless steel two-zone dimpled jacket enables heating/cooling of the product. The flush tank ball valve mounted on the vessel’s bottom front features a 150# ANSI flange outlet connection, pneumatic actuator and air-powered open/close controls. 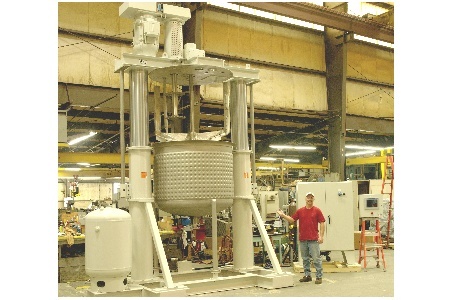 The vessel is mounted on three legs suitable for use with load cells. A Ross SysCon NEMA 12 Dual Axis Control Panel houses the Variable Frequency Drives and PLC Controls. A separate NEMA 4 Operator Panel includes a 10" color HMI touchscreen for controlling speed, load and product temperature, as well as saving up to 10 recipes.